Whether it be a small form factor UMPC or a full-blown desktop replacement, the proportions of your portable have never been so well catered to. 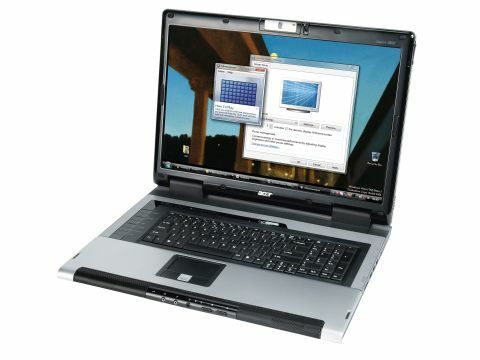 Acer enters the latter market with the Aspire 9800, the largest of the Aspire series. And while its siblings offer scale in the form of the 7100 and the 9000 at 17-inch and 20-inch respectively, the 9800 has a 20.1-inch screen combined with the kind of Core Duo power many true desktops lack. For the moment however, we'll focus on the 9800's most striking feature: its sheer size. The 20.1-inch wide aspect ratio screen sets the tone for the rest of the chassis, which weighs in at a staggering 7.8kg. And while this means portability is restricted, the 9800 isn't designed to be moved that often. To this end, Acer has made sure all the furnishings of a desktop are present. As well as 12 quick launch buttons - covering everything from media player controls to email and web access - the 9800 has USB, Firewire, multi-card reader, and an Express card port. On the back there are S-Video, Ethernet, AV-in, two AVI ports and DVI should you wish to output to another monitor, as well as a TV input and parallel port. The chassis is in line with Acer's other models. The near-full size keyboard is firm and comfortable and offers the most resting space of any laptop we've reviewed. The tracker pad is responsive, and a silver raised square that splits the left and right mouse buttons allows fast-scrolling. At the foot of the case rests Bluetooth and WLAN radio latch-switches. Audio in, out and a headphone socket sit on the same panel flanked by a large speaker unit, while the side houses an impressive DL multi-DVD writer. The screen is equipped with Acer's CrystalBrite high-contrast coating, which renders video and images superbly. It's possibly the best laptop screen we've seen, but considering you'll never use the 9800 on anything other than a desk, a true standalone monitor would offer better quality and more flexible viewing options. The screen has the potential to offer miles of desktop space, but is let down by the 1,680x1,050 resolution. Less expensive models offer 1,920x1,200, and with the 9800's screen measuring 30mm in depth, it seems more than likely that Acer has simply bolted on one of its desktop offerings. And though we're big fans of Nvidia's GeForce 7600 in its desktop incarnation, the GeForce Go 7600 present here just isn't powerful enough to drive the screen's 1,680x1,050 resolution for gaming. One added bonus, though, is the 1.3 megapixel camera mounted to the top of the screen. This works very well, and although less of a necessity, it shows Acer's intent to cover all areas. Yet where the 9800 beats other desktop replacements is its power. An Intel Centrino Core Duo T2300 powers the 9800 along at 1.66GHz, complemented by 1GB of fast DDR2 memory. A TV tuner is also present, and allows access to both digital and terrestrial channels through Acer's Arcade software, which itself can be controlled via the bundled remote. With the dimensions Acer has to play with, the 9800 comes with two 120GB drives, set up in a RAID 0 configuration. This gives ample storage space, but we encountered huge problems trying to reinstall Windows without the aid of a floppy drive, and even resetting the RAID configuration proved unworkable. This led to struggles in benchmarking and prevented us from carrying out a successful SYSmark run. A further drawback is the battery life of the 9800, which at only 74 minutes proved hugely disappointing. At first this seems ludicrous given the size of the unit, but considering most 9800 buyers will only move it short distances - and even then it'll have to be desk-mounted - means that a power adaptor will always be on hand.